Surely the most impressive live act to emerge during the golden age of Australian pub rock, Midnight Oil enjoyed a watershed year in 1984. They recorded and toured their landmark fifth album, Red Sails in the Sunset, to manic crowds of mulleted fans, a tour captured on 16mm by filmmaker Ray Argall. 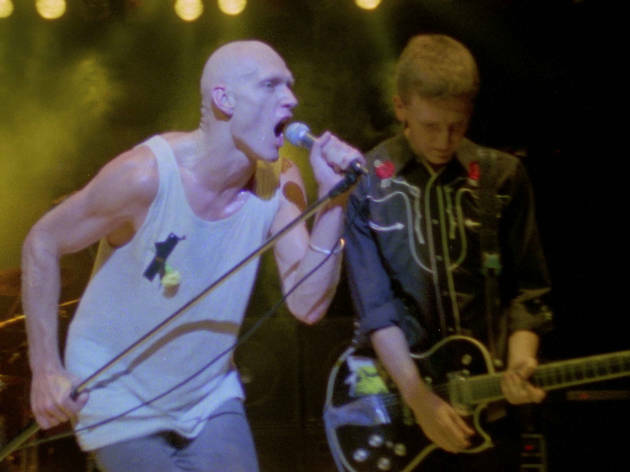 The camera kept rolling as lead singer Peter Garrett announced his candidacy for the Senate in the federal election that December as the leader of the newly formed Nuclear Disarmament Party (NDP). Campaigning by day and storming the stage by night, Garrett’s anti-Uranium mining, anti-Reagan rhetoric rattled the major parties to the extent that Liberal and Labor agreed to trade preferences rather than see him elected. 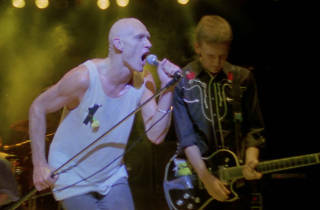 This is the febrile time captured in Argall’s Midnight Oil 1984, a movie in the tradition of concert films like Woodstock that are also political snapshots of an era. The filmmaker (who shot music videos for the band and made an indie gem, Return Home, in 1990) drew upon the goldmine of footage that sat gathering dust in his garage for 30 years to produce not just a monument to a thunderously good rock’n’roll act but a portrait of a youth movement that seems astonishing now. Astonishing, too, is the band’s political commitment: they were “prepared to lose everything” if Garrett won his seat and ended up in the Senate for six years. All the hits are here, nice and loud (a superb job has been done remixing the sound): ‘When the Generals Talk’; ‘The Best of Both Worlds’; ‘Short Memory’; ‘US Forces’; ‘Read About It’, ‘Armistice Day’. Venues range from crowded, unairconditioned pub bandrooms where the ceilings literally drip with sweat to the Hordern Pavilion. The band, who built their following not through chart hits or Countdown but by relentlessly touring the length and breadth of the continent, preside over scenes of barely contained chaos. At one point Garrett diffuses a pair of thugs in the crowd like an unusually electrifying maths teacher; it’s the same crazy-eyed charisma that enables him to deliver mini-lectures between songs to receptive kids who’ve just reached voting age. Malcolm Turnbull would quake in his baby boomer boots. But when it comes to shaking, Garrett is king. The gangly singer’s jittery, unhinged onstage dancing is the perfect expression of music that is blunt, angular and focused on uncomfortable truths. He’s like a clownish blend of David Byrne, Frankenstein’s monster and Marlon Brando’s mad colonel from Apocalypse Now, with a singing voice that’s a nasal bark, Australian to the very core. The Labor minister he would eventually become may have been less of an iconoclast (to put it mildly), but this film is a bracing reminder of the vitality he once represented, and the greatness of a band the likes of which we’re unlikely to see again.